When pruning gives you lemons. . . Careful pruning this year means that the Meyer tree is doing what all the other Meyer trees around here do -- pumping out lemons as though it's going out of style. This year, I went to BevMo and got prepared. There are many different zesting options in my drawer. I tried two at first. The little strip zester seemed to be better at taking off only the yellow stuff, but even that got more difficult. I may have become impatient after a few tries, too. Then I remembered a post somewhere on the internet about zesting essentially from the inside out. Tablespoon to the rescue. If I aimed correctly, I ended up with a round bit of lemon and an empty shell. Then the fun really started. In varying ways, I tried holding down the half shell and scraping out the white pith. Everyone is really serious about how you must get all of that white pith out, or doom will ensue. I tend to take stuff like that pretty seriously, and then spent all of the time (except for the brief errand run for chicken food) left obsessing about whether or not I was getting all of the stuff out. The peels didn't always stand up well to that kind of force, but my cutting board is well-oiled with pure lemon oil. My hands aren't super happy, though. The jar has many different bits of scraped peel on it. I aimed for the clearest yellow part of the piece to the right of the spoon in that picture, and mostly think I got there. We'll see. So, in a few months (?) we'll see what I've made. Ellie and I were talking as I was buying the Everclear, and I was explaining that it's pure alcohol, famed for fraternity parties and making people extremely inebriated, but that it didn't have a flavor to interfere with the lemon flavor. So she said, "You're making alcohol that tastes like lemons?" "Well, after the peels have steeped for about a month and a half, we'll add some simple syrup, you know, water and sugar boiled together?" "So you're making super-alcoholic lemonade?" "I'm not serving it to people by the TUMBLER!" The funny thing is that I may not end up serving it to anyone. I'm the only one in the family who actually seems to like the nocino that I made, and even I rarely drink it. A digestif seems odd drunk alone, to me. Anyhow, the few times that I have encountered limoncello, in Sorrento, and other Italian towns, it wasn't exactly love at first sip. In fact, I reacted a lot like the character "Ben" on Parks and Recreation in this clip. Just hated it. Like bad lemon-flavored cough medicine. To be fair, I'm also so-so on Lagavulin. . . So why make something that makes me want to wipe my tongue? Well, it might be different. But someone, somewhere may like it, and hey, it's a new thing to try, right? After the busyness of getting ready for the holidays (see, we did decorate these houses, although Oona kind of wandered far afield from the whole "sticking things on cookies" theme), things have gotten very quiet today. Math with a nearly-asleep dog in one's lap. Reading with a chewing dog in one's lap. What happens when the kid gets the camera. I had hoped to feature the knitting I was doing -- knitting I wrapped up as a gift, still on the needles. It will be done, really, soon. I promise! When I was out making pointy mulch piles flat with the help of my inexplicably broken rake, I remembered that the chickens needed water and probably food. Look what was waiting in the nest box! The days are lengthening, but I didn't know the chickens had noticed yet. In a previous life, I studied counseling psychology and had to take a lot of tests. Personality tests, intelligence tests, tests of psychosis, etc. While scoring low in psychosis, I tended to score high in what was called divergent thinking -- thinking out of the box. Do I still put this trait to use, lo these many years later? Exhibit A: gingerbread house pre-assembly, without uniform pieces. If I can keep the dogs from snacking until that icing sets up, these little A-frame cabins are going to be turned right side up and hidden until tomorrow, when the decorating will begin. This year we'll have a detail-minded eighteen year old, five other people, plus a three year old around the table. Should be interesting. Yesterday, the whole family plus our bonus friend went to Santa Cruz to see whales. But first, we saw sea lions. They looked, according to our youngest two, like "jumping olives." The humpbacks aren't supposed to be here this late in the year. A record anchovy run, caused by a warmer than usual fall, apparently has brought out the glutton in whales. What amazed me was that, even from a 60' boat, they looked pretty big from 100 yards away. They also seemed happily buddied-up, cruising along together and chomping surface fish. These guys are probably younger males, resisting the call to go to Chile to breed because of two things (this is my surmise; I didn't check it out with the über-professional naturalist): they probably don't have a really big chance to breed, being young guys -- I assume all the mamas are sewn up; and two, there's all this fish still here! Why not stay and eat? It reminds me of a softball team at a pizza joint. The whale backs that show as they roll through the water are only a fraction of their size. Something like a tenth, according to the boat folks. Sometimes we'd turn and see them from the back as they swam away from us. They looked like draft horses -- huge around the middle. Just great animals, really gigantic. And every once in a while, they'd say goodbye and dive. We're super fortunate to be able to see migrating and feeding whales relatively near home. We didn't even have to leave the Monterey Bay. Gorgeous December weather, and a pretty drive. The kids were pretty tickled, and only two of our party suffered from the bumpy water, and both only at the tail end (hahaha) of the trip. They suggested we come back -- a lot. I don't know that I would necessarily do it from a boat again, but watching the whales was pretty cool. And, quite frankly, I don't know how many more years this sort of stuff is going to happen -- the ocean feels kind of under siege lately. I'm glad we got to see it now. Mama and Mmmmmmmmocha Nut Butterballs. In our house, that means Christmas! It also means the start of Stefani Not Eating Them All, which is an actual season, but more difficult. 1. Preheat the oven to 325 degrees F (165 degrees C). Stir together the flour, cocoa, coffee crystals and salt; set aside. 2. In a large bowl, cream together the butter, sugar and vanilla until light and fluffy. Mix in the dry ingredients just until blended. Stir in the pecans. Roll dough into 1 inch balls and place them 2 inches apart onto an ungreased cookie sheet. 3. Bake for 15 to 20 minutes in the preheated oven, until the bottoms are lightly browned. Remove from cookie sheets and roll in confectioners' sugar while still warm. Store in a tightly covered container at room temperature. And now for the rant. I finally deigned to listen to the local station that does continuous Christmas music, figuring it would get me into the mood a little bit -- hey, I made the cookies, right? I was thinking maybe some Handel, some Santa Baby, some In the Deep Midwinter? But nooooooo. I hit, first thing that crummy, stupid, execrable song about the boy with the dying mother who is buying her pretty shoes to meet Jesus. I cannot say enough about how horrifying I find the whole thing. It's really everything I hate about everything in one little package. I went back to punk on the Mp3 player. It's what is passing for my knitting project these days. Having misplaced my almost-done project and the project bag it was in, my knitting mojo took an enormous hit. It's metastasizing all over. I can't seem to get anything done. Drafts of writing due, essays to edit, gardening projects (heloooooo, mulch), nothing. I've got nothing. So, I figured instead of launching into my next big colorwork sweater project, which would involve, oh, designing a sweater, I'd find some sort of mindless make-a-sweater-without-thought project. This bag of vintage yarn, given to me by Sainted Betty, my Knoxville knitting teacher, has come along and seemed appropriate. Alas, it's a mess of mild tangles. Technically, I don't even think it's tangled. It's just that yarn has stored energy and if it's allowed to twist, in, oh, I don't know, multiple moves from state to state, it needs undoing. So when I can't engage my brain enough to do anything, make anything, finish anything, and I've done the housework and the kid wrangling and carpool driving and dinner making and dinner cleanup, well, working on these twists and turns feels as though I'm accomplishing something. It's not going to get Christmas sorted here, though. Bleah.
. . . Ultimate time!! The high school season is slowly beginning, despite record low temperatures. The two younger kids and I may never warm up after watching three games in a row. But it was wicked fun. The team even did my two favorite cheers. I love the intensity and fun the kids bring to the game -- "Eat the babies!" And, you know, as an almost-50 year old woman, I don't often think to myself, "I wish I could trade bodies with a 17 year old for. . . just a couple of hours," but when I do, it's during Frisbee games. And when they fling themselves on the ground, as they did repeatedly during the second game? (I would have bet good money they were just messing with us at that point.) They bounce right back up and do wonderful things. My second girl can throw on a hard mark. But she was a little winded. I had to laugh when I saw that after a terrifically long point, with many turns, she was taking breaks bent in half with her hands on her knees, a position I know very well from my own forays into running around. After one long series, she staggered off the field and collapsed. This was just before she pathetically asked me to throw her a Gatorade. . . I love this sport. I love to play, I love to watch, I love the kids, I love the coaches, I love the other parents. I do not love the cold. Fortunately it's supposed to get a little better after tomorrow. And yeah, yeah, yeah, I know everyone everywhere else has it worse than we do. But for me, and where I am? I'm cold. Brrrrr. If I could read a calendar, if be on a whale watching trip right now. 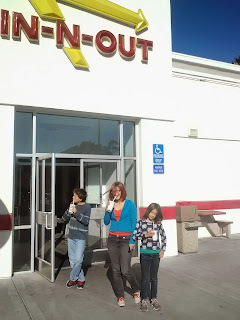 Fortunately, sitting in an In N Out burger is okay. This has been one of the happiest drives I can remember with my children. For example, there was the question, "What would your superpower be if you could have it?" It's one of my favorite car games. Tor said, "I'd turn into Batman." Katie said, "I'd be able to move things with my mind." Ellie said, "I'd control people's minds. . . "
I can think of few more horrifying things than my 14 year old controlling people's minds, so the game devolved from there into a discussion of how she'd not be evil, just make people do what she wanted them to do. Of course. Rolling by the beautiful hills just east of Fremont, I thought how wonderful the day had been. Fortunately, their good moods lasted through all the songs on the radio. "Sweater Weather," anyone? It sure is cold. . . We belted out song after song after song, and I insisted on total participation when Van Morrison sang about standing in the sunlight laughin'. I really couldn't have asked for a better couple of hours. So the trip is rescheduled; hope the whales wait. . . meanwhile I have supplies to finish a tree skirt, the big dog is getting an unanticipated visit to the dog park which is usually Taz's sole domain, and there's the Mayor's Christmas Tree lighting tonight downtown. Wonder if it will be worth it to bundle up and brave the cold for that. Edited to add, NO WAY! It's not as though I don't suddenly have time. Two days of visiting Arctic weather have provided a lovely example of warm weather vs. cold weather crops. Note the unharvested, yet perfectly edible, fruit on both of those. Oh, goody, voices in my head, another stick to beat myself with! I may try to grab them, and yet . . I may not. What I will most likely do, however, is serve a broccoli dish tomorrow, so as not to waste everything coming out of the yard. If a woman has a mulch pile to shovel, first she must shovel up, scoop by boring scoop (with apologies to Paramore, but I sing in my head all the time) half of the pile. Then she must trundle these half-pile loads elsewhere, and dump them, leaving the raking of them flat for another day. But, when half the pile is gone, there remains half of the remaining pile, and so on and so on. There's apparently a long challenging (to me) maths explanation as to why I will not have a pile of mulch blocking my driveway forever here, but I'm starting to wonder.The only way I can tell I made any progress at all is that one corner of the door is uncovered, and there were damp patches under the stuff that got moved. Fortunately for my sanity, and my back, that's not all I got done today. Our lovely neighbors let me put the cherry tomato plants in their green waste bin, since ours is overflowing thanks to nephew's enthusiastic pruning of some trees. Amazing what you can get a big 13 year old to do if you offer a machete and a ladder. . .
Like Robert Frost's apple farmer, I know what will trouble my yard in spring, though. Volunteers in the making, no matter how much mulch gets shoveled on top of them. And once all of the vines were cleared away, I could see this lovely thing waiting for discovery. Crunchy, cold, perfect balance of tart and sweet, this Fuji made a great post-Ultimate hobbit second breakfast for me. Of course, clearing things away meant I could see that not only am I not the only one with designs on the apples, but there's a bad infestation of powdery aphids on the tree. Time to get out the oil! Perils of seeing reality clearly. Yesterday I thought I might get rid of all of the mulch. I had my work outfit on. It's fluffy, easy to move, and there are/were many places that needed covering up. So I trundled. Over and over and over, assuming I would keep doing that until I either fell over or finally cleared the great pile. I didn't finish, however. The kids had needs and wants, and I ended up driving hither and thither, as Sarafina once famously said at about three years old. So today, I shoveled more. It's still not gone, but there is a bigger dent in it. Between tomorrow and the rest of today, I ought to be able to get it done, if I don't get distracted again. There are so many things to clear out of the garden, leftovers from the spring and summer. The asparagus appears to be finally dying back, but it also has the weird winter sprouty thing going on that it had before. I pulled bean vines after bean vines, and ended up with a tangle of vines and more pods to shell. With continuing fog and possible rain, I've got to get on top of this stuff. . . and yet, it is sort of sad. So much summer dying out there. There are still peppers and green tomatoes, and I could probably let it all go, but I am done. Done, done, donnity done, as I said when I told the local beeks I was selling equipment. Time to clear out. The nice thing, though, about gardening and probably life, is that clearing out makes room for new growth. Sometimes it's great growth like the kale crops doing so well in this bed, and sometimes it's weeds. The oxalis is everywhere in the garden. All I can do is faithfully tend and wait patiently. Oh, and get out there and shovel some more!